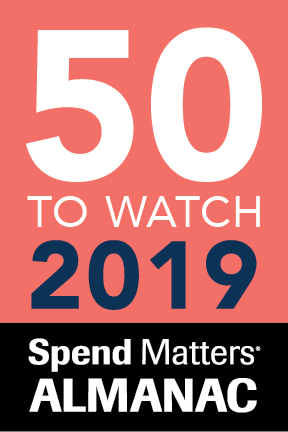 Spend Matters has revealed the 50 Providers to Watch for 2019. Each year the 50 Providers to Watch list recognizes the fast-rising companies in the procurement and supply chain market. These are the up-and-comers: solution providers who continue to grow and develop innovative products propelling the market forward. Vendors listed are independently selected by the analyst team over multiple rounds of debate, focusing on factors such as growth, innovation, tech capabilities, and solution delivery. Where applicable, providers go through the rigorous SolutionMap evaluation process. This marks the sixth year of publication for the Spend Matters 50 to Watch as well as its counterpart, the 50 to Know. Typically the Providers to Watch list sees more turnover than the Providers to Know, and 2019 is no exception. Fully half of the list is composed of companies who were not featured last year. Newcomers encompass all solution categories imaginable, from supplier risk (DHL Resilience360) to AP automation (NVoicePay) to sourcing (Allocation). A few providers make triumphant returns after years off the lists, such as aPriori, Llamasoft, and Zylo. How are the 50 Providers to Watch Chosen?